In order to protect the natural resources of parks, designated campsites, and even long-term resident summer camps, park managers often contain activity to certain areas to minimize short- and long-term damage. It may not seem like much can happen by a few hours lounging at a park or camp, but even a single hammock—if improperly hung—can dig into the bark of a tree (particularly one with soft bark), break tree limbs, rip up small trees, compress the living cambium layer, or even scratch scars that invite bugs and disease. Visual damage can be immediate on some trees, but it can take months or years before the internal damage is apparent. Parks and campsites are popular places and attract thousands of visitors each year. If hammocks are allowed, be sure to hang responsibly by using wide webbing straps instead of ropes. Hammocks can be one of the best low-impact forms of camping when done correctly. With proper anchoring, little to no damage is made to hearty trees. Hammocks also limit the kind of ground compression that is so common with tents. If you are a park manager or ranger, there are lots of ways to accommodate hammocks and make the experience enjoyable. Hammocks are great for relaxing and lounging at a local park. The sad news is that inexperienced hangers, along with high-volume in small areas, are creating an negative impact on the trees. I’ve seen areas where folks are hanging hammocks from anything they can tie a rope to, including small trees and branches that are not as suited for load bearing. In state and national parks, some resources may be protected because they are in short supply. My backpacking trip into the Grand Canyon is one such example. In these areas, I recommend installing simple pipe stands that will work for hammocks and also provide places to hang gear. In the Grand Canyon, these pipe stands are used to keep food away from the mice. 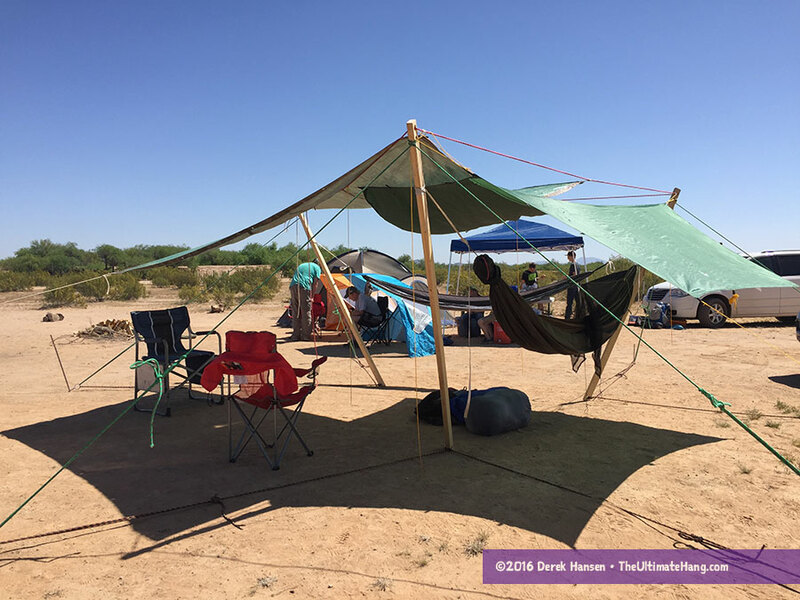 With regards to scout camps and locations managed by rangers, there may be many reasons why restricting hammock camping is appropriate and reasonable for resource preservation. Philmont, for example, has a no-hammock policy because their backcountry treks are extremely programatic that restrict camping to specific locations used by thousands of scouts in a single season. To best manage their resources, they have appropriately restricted hammocks. However, just because the natural resources need to be protected doesn’t mean we have to outlaw hammocks completely. In some areas, hammock camping may actually provide a better resource protection over time than other shelter options. If you are a camp director or ranger, I recommend installing low-cost, low-maintenance hammock stands in your camp. Hammocks are a great alternative to expensive platform-style tents. Indeed, in some areas, pavilian-style canopies could be constructed (or used, if already existing) where dozens of scouts could hang in a relatively small area, thus reducing impact and improving the overall look of a camp in the long term. Inexpensive metal pipe stands are a great way provide hammock hang areas. When cemented into the ground, these stands can be set up in a circular formation off a central hub, providing a concentrated, low-impact site for those who want to hammock camp. Special events are unique in that they are often built in large fields or expanses to accommodate a lot of people in a confined space. Even so, these events are often built up into mini cities and can last as long as a few weeks. Portable stands are often the best choice for hammocks in these locations. Free-standing tripod designs are sometimes required if anchoring is not allowed. The tripod design can be pre-manufactured, or built on-site with renewable resources such as bamboo or recycled poles. These hammock villages can be used to teach and reinforce skills such as lashing and knot tying. One of the great advantages of these hammock villages is that you don’t have to worry about burning the vegetation as you when tents are pitched on a site for a long period. Compression of the soil is also not a problem. In other words, the site will recover and rejuvenate faster with less noticeable impact than with traditional tent cities. Anchored stands, like the three-person tensegrity stand, can be inexpensively built and can easily fit into a designated spot. The struts also create nooks that are perfect for small pup tents. Hi. Florida State Parks is beginning to accept hammock hangers but they require 2″ webbing for hammocks AND tarps. Dutch sells the 2″ webbing but no special hardware. I did start a thread on this in The Dutch sub-forum on Hammock Forum. I was wondering whether I could use 1″ webbing, joining (by stitching together with zigzag stitch)) two widths around the tree portions and then be able to use (perhaps) an Adutchable Clip. Perhaps you could do some research and experiments. Thanks. Great idea for parks and public places! Unless you are using lots of concrete the 1′ 6″ and 2′ holes are likely too shallow. 2′ 6″ and 3′ is the recommended minimum depth for hammock poles, due to the forces from typical or low angled hammock hanging around 300 pounds often and that does not count the bouncing or multiple people in one hammock. My experience is with Texas soils. Hi Derek! Great article. This is my first summer hammock camping and I’ve been running into this problem researching campgrounds in Colorado. I definitely understand protecting our trees that have been damaged by pine beetles, but in some areas rangers just seem particularly resistant to hammocks. My Pares hammock straps are not 2″ wide. Can you recommend a brand of straps that are 2″ wide? We are working on a Grant Application and are in need of furnished and installed (if possible) unit price and the price for 12 of the hammocks. I don’t sell hammocks so you would need to reach out to a manufacturer directly.